Flags flutter from the ramparts, race officers look down from the imposing starting platform, and at ten-minute intervals mighty brass cannon fire with such power that spectactors lining the shore wince and plunge their fingers into their ears. 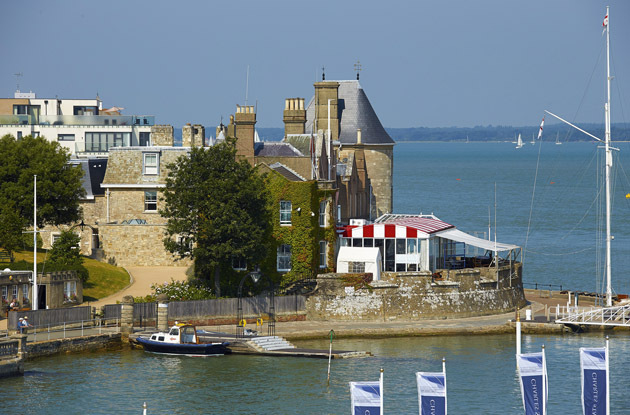 The Royal Yacht Squadron’s Castle clubhouse is best known to most sailors as the centre of the action at Cowes Week. Puffs of smoke in the aftermath of the bangs waft across the water towards the fleets of yachts, their crews’ faces pinched with concentration as they plan their beat up the rocky Island shore. No first-timer to Cowes Week can fail to be awestruck by the Castle. Competitors mill around before their starts, staring at the flags and course-boards, getting a sight down the startline straight into the windows. Looking is as near as most sailors ever get to this most aristocratic of clubs. Members will repair to the Squadron after racing, taking tea on the lawn, before entering the Castle for cocktails before a party or the fabulous Squadron Ball, but for the rest, the Castle itself, built by Henry VIII to repel the French, is a visual symbol of the club’s exclusivity. The most prestigious club in Britain, possibly the world, is wreathed in mystique. The only way to join this club of Kings, Lords, Hons and Sirs is to be invited by a member and be subject to a secret ballot. The fact that the membership list reads like Debretts is an indication of most sailors’ chances of being invited. It’s said that wealthy tea merchant Sir Thomas Lipton was blackballed for being ‘in trade’, which is why his 1898 bid for the America’s Cup was sponsored by the Royal Ulster YC. He was allowed in eventually, but died just two years later so scarcely had time to enjoy the Castle’s delights. Some accept a blackballing with grace, others kick up a stink, like the owner of a 150-ton schooner who, the story goes, sent a message to the club that he was anchored within close range and would commence shelling unless he received a personal apology from Percy Shelley, son of the famous poet, who had blackballed him. The appeal of being a member is obvious. Who wouldn’t want to fly the white ensign from their stern? The Squadron is the only yacht club with a Royal Navy warrant to do so, granted in 1829. And who wouldn’t want to walk boldly in to meet and drink with the great and the good? Originally named The Yacht Club, it was founded on 1 June 1815 by a group of 42 gentleman yachting enthusiasts. Five years later, member King George IV conferred the Royal in the club’s title and in 1833 King William IV renamed the club the Royal Yacht Squadron. Members met in the Thatched House Tavern in St James’s, London, and in Cowes twice a year for dinner. Today there are 535 members and dinner is served in the magnificent Members’ Dining Room, under the painted gaze of illustrious past admirals and commodores. The room is adorned with silver trophies and scenes of the high seas, and waiters bring course after course from the kitchens and wine cellars below. 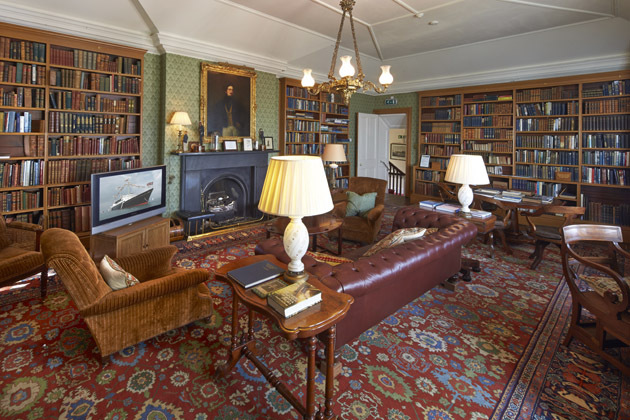 There are bedrooms for overnight stays, a room for members to keep their ‘mess kit’ or black tie, which is required dress on Saturday nights, and even gun lockers for shooting parties. But sailing is the club’s raision d’être and neither a title nor a fortune are a guarantee of entry. The club professes that “any gentleman or lady actively interested in yachting” is eligible for nomination. 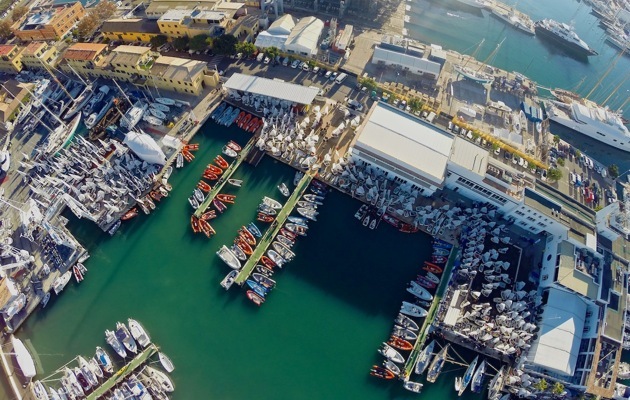 The Squadron was where yacht racing was born. In the early 1800s the aristocracy came to Cowes to socialise and cruise in their boats. The first races were duels between the yachts of the day, then rules for fleet racing were drawn up. The first club regatta, later to become Cowes Week, was in 1826. For more than a century the reigning monarch would be there to present the King’s or Queen’s trophy. Some of history’s greatest yachtsmen are on the Squadron’s membership roll: Sir Thomas Sopwith, John Illingworth, Sir Francis Chichester, Sir Alec Rose, Sir Robin Knox-Johnston. Ties with the Navy are strong and some of British maritime history’s most famous names have been Squadron members, not least Nelson’s vice-admiral Sir Thomas Masterman Hardy who commanded HMS Victory at the Battle of Trafalgar, Admiral Lord Cochrane who was the inspriation for C.S. Forester’s Hornblower novels and Admiral Sir Jeremy Black, captain of the aircraft carrier HMS Invincible during the Falklands War. Perhaps the club is still best known around the world for hosting the race around the Isle of Wight in 1851 won by the schooner America, which took home what became known as the America’s Cup. The Squadron donated the Cup itself in 1851 and mounted a number of challenges to win it back. More than 160 years later the America’s Cup has still never been won by a British challenger, but now the commodore believes the Royal Yacht Squadron has “the best chance we have ever had” with its sponsorship of Ben Ainslie Racing as official British challenger for the 2017 Cup.